You don’t have to listen long to any country music with an ounce of heritage in it to come across a tune played in the old three-four time. The waltz has been an integral part of country music for as long as couples have been heading down to the honky tonk to dance away the troubles and woes of a rural life. 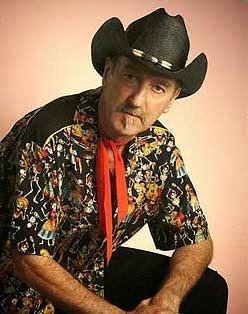 So in an age where there are a significant number of performers still keeping the traditions alive, UK country legend Hank Wangford has raised the preservation stakes higher by dedicating a whole double album to the sound which he proudly implies as always been a differentiation marker between country and rock n’ roll. Hank has contributed around half of this twenty-five track set with originals and for me there are three with particular stand out qualities. From ‘The Light’ disc ‘Sunk Without Trace’ and the album’s title track ‘Save Me The Waltz’ have a special quality about them to take their warranted place amongst the classics. Perhaps the finest of all Hank’s compositions included is the ultimate ‘giving up’ song ‘Lonely Together’ which proved a great sing along live number when Hank previewed this album with a duo show in Birmingham in February. This track anchors the final segment on ‘The Dark’ disc which also includes a Lennon/McCartney song ‘Baby’s In Black’ and another old Billy Bragg duet, this time on the Woody Guthrie song ‘Deportees’. 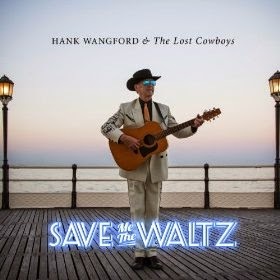 Hank’s long time band, The Lost Cowboys, make their presence felt on the record which was recorded in several locations, one including an old Telefunken microphone bought from the Abbey Road studios. Amongst the Lost Cowboys line up are UK pedal steel luminary BJ Cole and Martin Belmont who has recently been doing some stellar work with My Darling Clementine. However all tracks have benefitted from a lengthy list of contributors with Anna Robinson significantly stepping in with the Lucinda Williams vocal piece. SAVE ME THE WALTZ gets its formal UK release on May 26th but if you pop along to one of the designated preview shows beforehand, a copy will surely be available. Either way this double album is an essential addition to any country music library and even the most ardent new country advocate would admit the waltz deserves its place in the genre’s DNA.